It is time for me to look at some of the PRS funds (due to taxes) and I thought that unlike last year, I want to do some research. Last year, I just went to a most convenient bank and picked an aggressive growth fund as I thought that with many years to reach 55 years old :), hence I might as well be slightly aggressive. This year though, I wanted to take a back seat and be conservative (to also balance my investment in fund). This means that for this year I am for conservative funds perhaps. 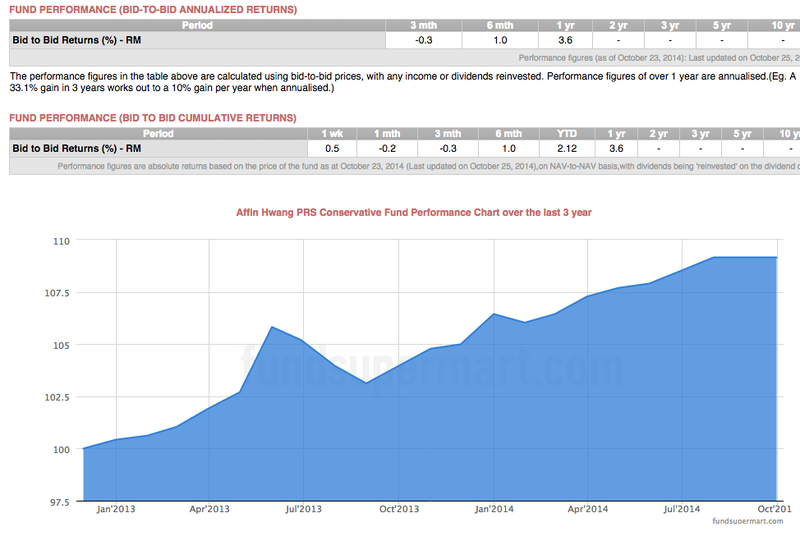 Taking a cue from AIA's Conservative funds (as below), a conservative fund basically invests 80% of the money into fixed income and money market instruments and remaining 20% into equity. Fixed income as in the name is most of the time investment into bonds (usually high grade) while money markets are securities which are shorter time in nature and these are high grade securities. All in all, I expect to secure decent and above fixed deposit rates return. Add in the tax incentives, it should be good savings and return. 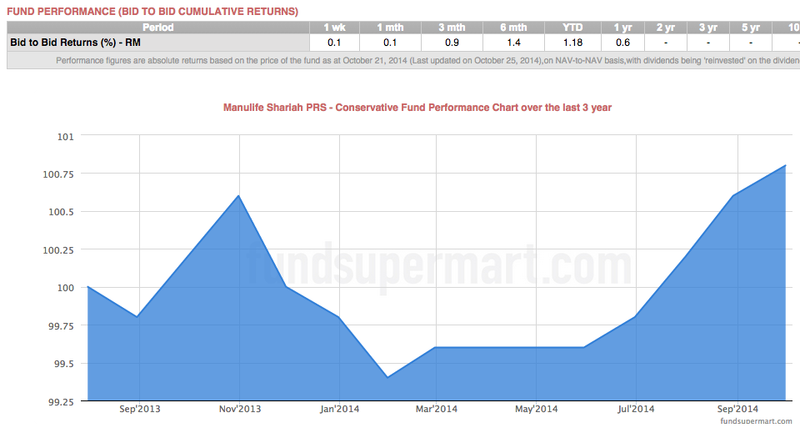 Based on the above, among the conservative funds, it can be said that over a short 1 year period, the best performing one at 3.6% return is Affin Hwang while worst performing one is Manulife Shariah at 0.6% return. On average, these 7 funds I looked at provided 2.557%. If I were to compare against most of the fixed deposits, they provide return of between 3.2% to 3.4% over the last 1 year. 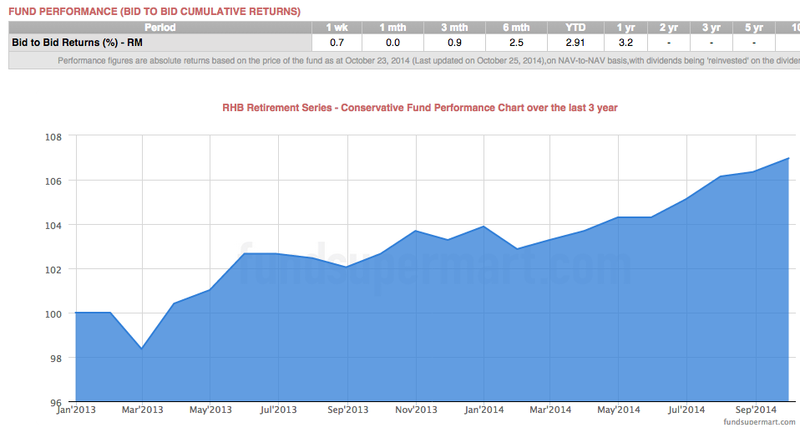 Could I claim that these conservative funds underperformed? In fact, if I were to eliminate the best and worst performing from the average, it is still giving average return of 2.74%. The worrying thing is that these funds does not create much value, except for the government's incentive of tax deduction up to RM3000 invested. One can argue that we should not look at these funds over the short term. I agree as I myself pitch long term. But these are funds that largely invested into fixed income securities. Fixed income provide in most cases fixed return. Yes, they are tradeable in the secondary market, hence the fluctuation in prices, but aren't one been paid and taught how to look at the interest and bond market movement? In any case, these are conservative funds. They are not creating value! To me. And without the incentives from government, these will not stick! P.s. I did not include some of the funds e.g. Public Bank's which registered 3.41% return over the last 1 year. Also the fund management guys will not like me, but these are FACTS! Another place to look at the performance is through Morningstar i.e. here. I tend to agree... Barring the tax deduction, they DO NOT create value... ..
What do the fund managers of these funds have to say for this horrible performance? These people are supposed to be highly paid professionals. It makes me wonder. Could you please inform us how much the indices performed over the same period? This will be telling. These managers, who undoubtedly will have many excuses, should be asked to explain. 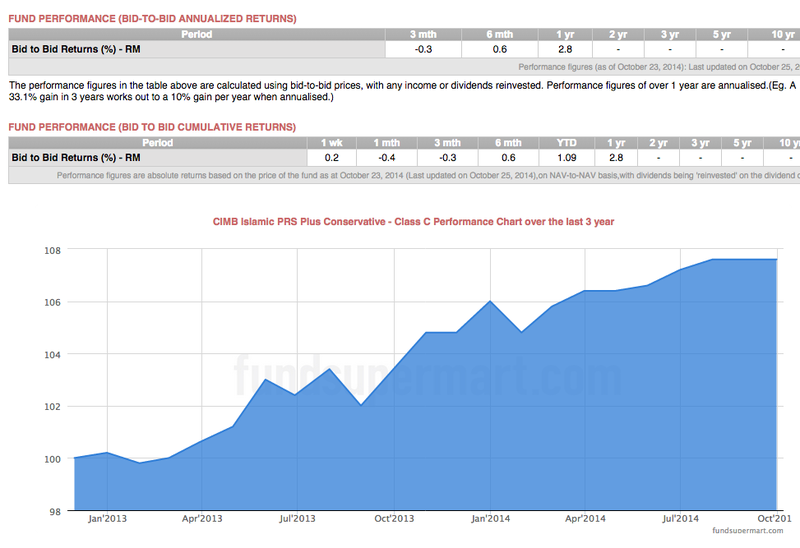 This however is a conservative fund mainly comprising of fixed income securities. Are those only the capital return or including dividends? Hi Felice, just curious, what is the reason of taking a back seat and be conservative this year? If the investment horizon is 15-25 years, shouldn't be equity the most sensible investment to make? (as you rightly pointed out in first para of your post) Unless you are expecting Malaysia to do another Japan in the next decade or two, otherwise we should see at least some 7-10% compounded annual returns when we wake up on our 55 years old birthday (who cares about volatility). Don't you agree? 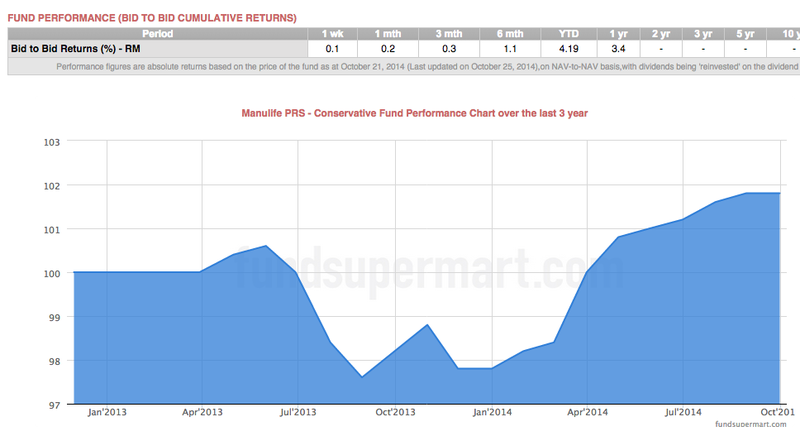 Forget about how conservative funds performed, I personally would never put my EPF money into those funds. If I can choose, I would put 100% of the money into index fund and sleep until 55 years old. You are very correct. There is no reason to go safe here. That was what I was thinking last year if I have horizon of some 15 years. Frankly, I am taking this as a test. Hence, for 1 year I am taking a growth fund, another year I will go conservative with different fund. But overall, I would go with funds with high equity exposure. Why does our government not give an equivalent tax incentive of RM3,000 deductible for equity or index funds investing? Due to its poor performance and high costs, PRS programme only benefits the scheme provider and not investors. Is there any local launched index fund in malaysia? I think there are but not for PRS.